Explanation: A mountainous region informally known as Tartarus Dorsa sprawls some 530 kilometres (330 miles) across this Plutonian landscape. Recently downloaded from New Horizons, it combines blue, red, and infrared image data in an extended colour view captured near the spacecraft's close approach to Pluto on July 14. 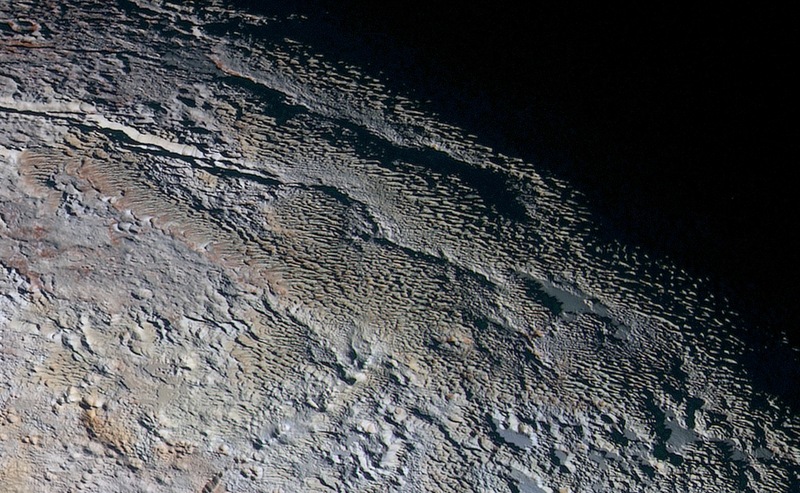 Shadows near the terminator, the line between Pluto's dim day and night, emphasize a rough, scaly texture. The stunning image resolves details on the distant world about 1.3 kilometres (0.8 miles) across. Refering to a part of Hades in ancient Greek mythology, Tartarus Dorsa borders Tombaugh Regio to the east.